On our recent Somme trip, we spent quite a bit of time walking the fields over which the RND attacked during Nov 13th - 14th 1916 during the Battle of the Ancre, so a post on this seems a good idea. The reason we spent so much time in the area is that it was the first time either of us could remember that the entire area of the RND attack to their first objective, the "Green Line" on Station Road and the slopes behind it, was walkable (i.e no fields in crop). On 13th Nov the attack was launched while still dark and with a thick mist. The Division made gains on the "Yellow Line" (second objective) on both the right and left sides of it's front. This was largely due to the initiative of the commanders on the ground, Colonel Freyberg (who won the VC for his actions) and Lt. Commander Gilliland. However in the centre, the attack was brought to a complete standstill by a Redoubt between the German first and second line of trenches, both the Hawke and Nelson Battalions being cut to pieces. It was not until the 15th, with fresh reinforcements and the use of tanks that the Redoubt was overcome and all final objectives (the "Red Line") secured. 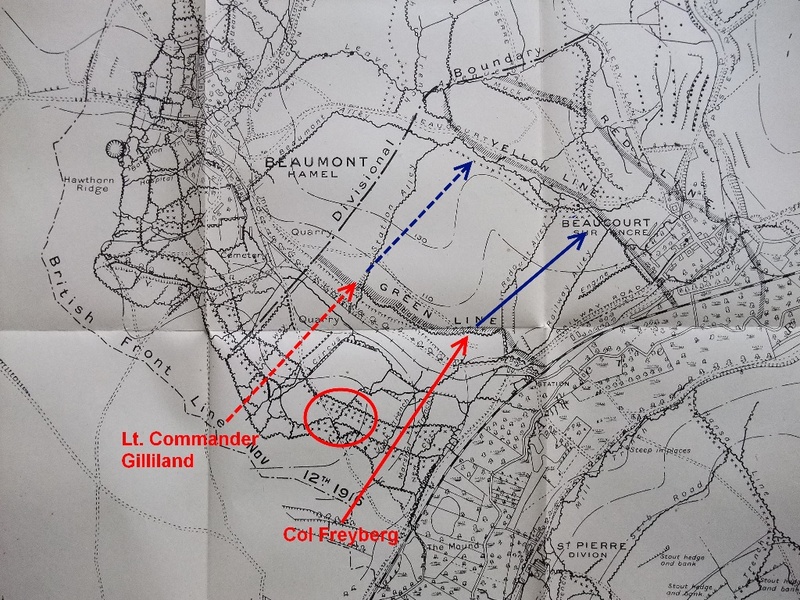 Above: Map showing the RND attack and the advance of Col Freyberg and Lt Commander Gilliand, to the first objective the "Green Line" then onto the second objective, the "Yellow Line". The Germand Redoubt holding up the advance in the centre is circled. Col Freyberg wanted to push on and secure Beaucourt but was ordered to stay on the "Yellow Line" due to the situation on his left flank. Beaucourt and the Redoubt were not secured until 15th Nov. Above: The ground over which Col Freyberg advanced. In the bottom picture, Station Road lies in the valley bottom with the "Green Line" on the opposite slope. Beaucourt is on the far horizon. Above: Remains of a concrete post on the German Front Line. The Redoubt that caused all the problems was in the fields behind. Fist image: The Circus - see map. The remains of dugouts can still be clearly sen in the bank. Second image: Screw picket still in situ at The Circus, overlooking Station Road. Third image: The valley in which Station road ran. Forth image: Looking across the Ancre valley to the Thiepval Ridge. Fifth image: Mills bomb in the field. Evidence of the German wire obstacle was also plenty with the remains of several screw pickets and much barbed wire. No evidence of the RND was found but we did find a Hampshire Regt shoulder title form an attack in Sept 1916. This area was attacked three times, on 1st July, during September and then in November 1916. Of interest to me were some old newsletters of the Royal Naval Division Association which I forgot I had but found them again just before going on holiday. They record two trips to the battlefields by members of the Association in 1974 and 1975. The report of the 1974 trip is particularly interesting to read. The 1975 trip may have been the last time many ever returned to the battlefields as the Association was wound up in 1982. "Could this, now very peaceful scene, really be also the devastated scene of those terrible, though triumphant conflicts. We are at the Divisional Memorial, overlooking the verdant valley. We recall the Battles." The party also visited the Thiepval Memorial and attended a Remembrance Service at the RND Memorial and a reception laid on by the Maire of Beaucourt, then visited the "beautifully kept and secluded Ancre Cemetery in which so many of our R.N.D. comrades rest". Today, it is still beautifully kept and secluded. Above: Top - the RND Memorial, Beaucourt. Bottom - The "beautifully kept and secluded Ancre cemetery". It is situated more or less on the British Front Line of the Battle of the Ancre. Another reception was held for the party in Albert and the battlefields of Gavrelle, where the RND fought in 1917, were also visited. "Here lies a generation of youth. The price of freedom". Cheddar Villa was the name given to a farm on the west side of the road from Wieltje to St. Julien. The area was part of the German gains during the Second Battle of Ypres, 1915. Part of the defences was a massive concrete pillbox, one of many in which the Germans waited in for the expected assault which began on 31st July 1917 - the Third Battle of Ypres. Above: The German pillbox at Cheddar Villa. A wide main embrasure would have taken an artillery piece while at least one embrasure for a machine gun can be seen. There are three separate chambers in the pillbox. The last image shows all types of scrap metal were added to the reinforcement! Cheddar Villa was captured on the first day of the battle - the 13th Royal Sussex captured 17 German officers and 205 soldiers from the dugouts and pillboxes at St Julien. The opening day of the offensive was reasonably successful, due to the heavy preliminary barrage of a massed 3,091 guns (of which 999 were heavy) which lasted 10 days and detailed briefings on tactics to capture the fortified buildings and pillboxes. These tactics consisted of outflanking movements covered by concentrated fire of mortars, rifle grenades and Lewis guns. The pillbox was then used as a First Aid post by the British. However the wide opening, which now faced the enemy, was hazardous and many soldiers who were sheltering in the pillbox were killed when a shell landed straight in the entrance. The success of the first day was not to be repeated - heavy rain saturated the low lying ground which had been churned up by the opening barrage and the offensive met stiff resistance in the area where the Menin road crossed the Wytschaete-Passchendaele ridge - the key to the German position. Above: Top - Seaforth Cemetery, Cheddar Villa today and in the 1920's. The cemetery was started on April 25th and 26th, 1915 during the Battle of St Julien (Second Ypres). Records 147 U.K., and 1 Canadian burials. A final stop off at Oosttaverne Wood cemetery on the way down to the Somme, arriving early evening for a few beers at Tommies in Pozieres﻿. Above: Oosttaverne Wood. 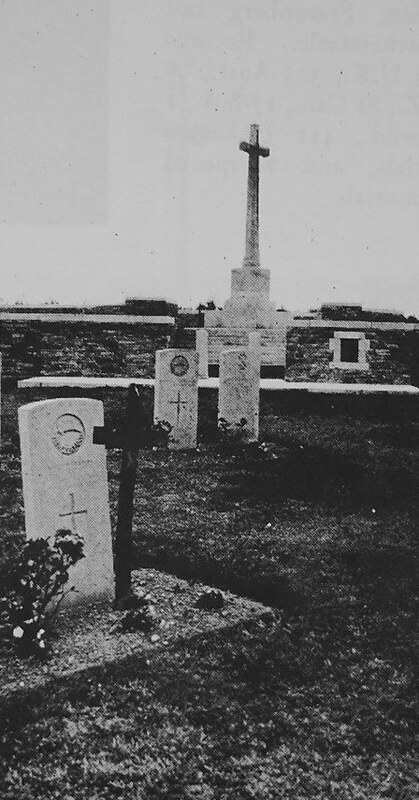 Third image shows the grave of Private H Anderton - the inscription added by his family reads "O WOULD THE KINGDOMS OF EARTH DECIDE THAT PEACE IS BEST". Bottom image shows one of two concrete blockhouses behind the cemetery. Catching an early ferry gave us time to stop off at a few sites in the Ypres area on our way down to the Somme. One site visited was Polygon Wood. By the time of the Third Battle of Ypres 1917, Polygon Wood was a German Strongpoint comprising of pillboxes and trenches. Above: Two images of the area just after Polygon Wood was captured showing the devastation. In the top image the Butte (old shooting Butte used by the Belgium Army) can be seen in the background. 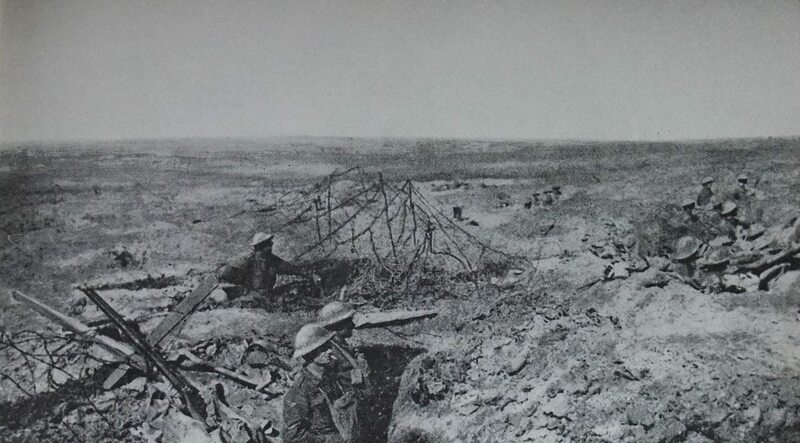 The second image shows troops of the 7th Brigade holding a series of isolated craters and trenches. At one corner of the wood a shooting Butte used by the Belgium Army until 1870 had been fortified by the Germans with machine guns, tunnels and dugouts. It was also a key observation point, with the trees gone, shattered by shellfire. As part of Third Ypres, the Australian 5th Division attacked and captured the wood on 26th Sept 1917. 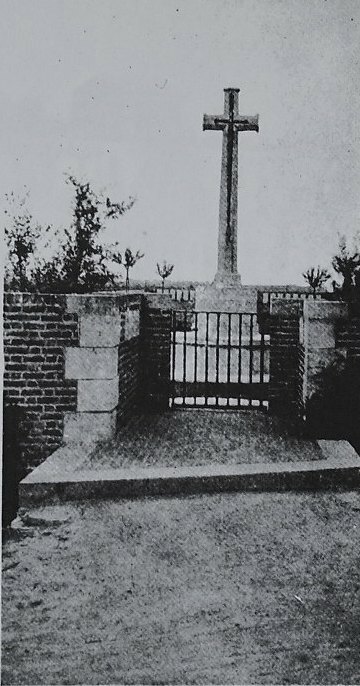 This was the one of the Division's best achievements during the War and that lead to the decision to erect the Divisional Memorial at the wood. The Memorial was designed by Maj. Gen. J J Talbot Hobbs, who commanded the Division during the battle and was an architect prior to the War, and was erected on the Butte. Above: The Butte in the 1920's and today. The Memorial to the Australian 5th Div was erected on top of the Butte. Today remains of some of the concrete blockhouses and shelters, both German and British, can be seen in the Wood. There are also two cemeteries - Polygon Wood Cemetary and Buttes New British Cemetery. Above: Some of the concrete remains in the Wood. Top two are remains of the German fortifications while the third and forth image are British shelters constructed after the capture of the Wood. Bottom image shows another relic of the battle, an unexploded shell on the edge of the Wood. Above: Polygon Wood Cemetery, used from Nov 1917 to Sept 1918. Records 44 U.K., 59 New Zealand and one German burials. Top and middle image shows the cemetery today and the 1920's. In the bottom image both the cemetary and the Australian Memorial on the Butte can be seen. Above: Buttes New Cemetery. Created after the Armistice. Records 1,317 U.K., 561 Australian, 167 New Zealand and 48 Canadian burials. On my way up to Birmingham to meet up with my brother for our annual Somme March Trip, I stopped off at Ixworth, at the kind invitation of Steve Wilson, to view the remaining village WW2 defences. Steve has done an incredible amount of research on the Home Guard at Ixworth, you can see this on http://www.ixworthvillage.co.uk. As Steve has told the story of the Ixworth Home Guard better than I can, this Post will just be some images of the remaining defences, of which I was extremely fortunate to be shown by Steve. Above: Spigot mortar in a private garden, found by the owner with his lawn mower while cutting the rather overgrown grass having just moved into the house!! Above: Spigot mortar on the High Street, now incorporated into a front garden flower bed. Above: Top - a Spigot mortar hidden by a single skin blocked hole in the wall which could easily be knocked out. An observation hole looks down the street (would of obviously been easy to look through with the weapon-pit in place, although this has been infilled). An incredible surviving example of how it would have been attempted to hide these weapons in a built up environment. Bottom image shows a loopholed wall in the same garden as the mortar (loopholes now infilled). Above: Last three images show some of the concrete road block cylinders that can still be seen in the village. The bottom two are of a smaller size to the top image, while the middle cylinder has been made into a roller by adding links for a tractor three-point linkage. I am extremely grateful to Steve for showing me around and to those landowners who gave permission to inspect the remaining defences on their property.